With the introduction of Chrome OS, it’s tempting to criticize Google for what seems like a half-baked product. Compared to OS X, Windows 7, or even Google’s own Android, there is a lot lacking. But there are interesting ideas, even if they are not the first to propose them. Where they’re not pushing the envelope enough is the interface. 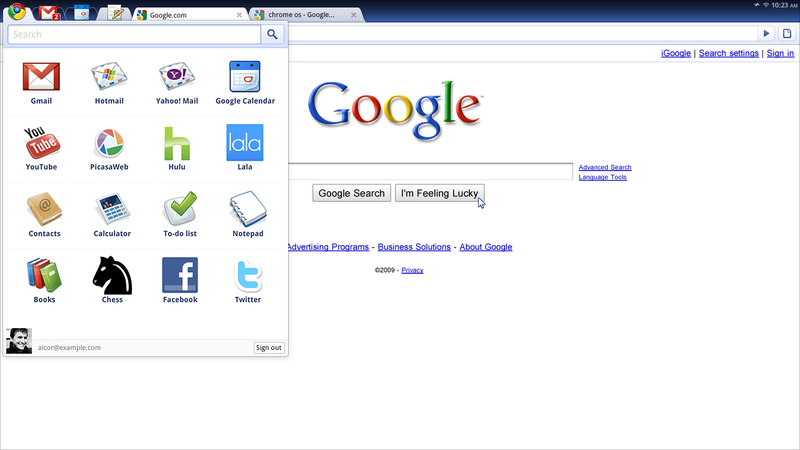 It’s a little disappointing that when they thought of making a web-based PC, they turned it into a web browser-based PC. There must be a better way to enable what they’re doing besides putting browser tabs at the top of the screen and an address bar underneath. It would be like Apple being unable to think outside their desktop OS and releasing the first iPhone with an interface that used a scaled down menubar. Where Google is pushing the envelope too much is the entire rest of the OS. It’s interesting in theory, but not yet practical. It’s a good thing they are starting down this road so that hopefully in 5 years it will have developed into something that will be useful. Currently, there’s simply not enough infrastructure in place to make it a successful experience. Where is your private file space in the cloud? When you buy a computer, included by default with any and all computers is space to store your stuff. You can share things if you want, but that’s something you opt-in to. If you buy a ChromeOS device, you had better be prepared to spend a lot of time getting up to speed on the privacy controls of each service you use, because private spaces in the cloud are hard to come by. Or you better know about dropbox/sugarsync/whatever and be prepared to pay an annual subscription to rent some online space. Simply put, the vast majority of people are not yet at this point. Internet access isn’t where it needs to be either. HTML5 is a great starting point for offline connectivity, but so far it’s only a starting point. Will ChromeOS store your entire Gmail archive in its offline database by default, so if you’re working at a cafe without internet, you can reference an email you sent 3 months ago? Not yet. Thinking about how ChromeOS is being developed and presented, one of the striking differences between Google and Apple is that Apple almost never* releases something before all the pieces are in place that are required to make it completely useful. Apple didn’t make the iPod when MP3 technology first appeared, they waited until they had music management software with an interface that made it easy to fill up an MP3 player AND enough storage could be packed into a small enough space that people could put it in their pockets. Whether Apple will successfully compete in the cloud is to be seen, but you can bet that they won’t release something along the lines of ChromeOS until they can craft an experience that fits seamlessly with the way people live their lives. And so this is the key to evaluating ChromeOS. It’s unfair to look at it as a finished product to be stacked up against whatever Apple and Microsoft have currently released. For all its flaws, it’s obvious that it isn’t a product built for now. It’s a starting point for the future. Google’s description of using it as a “companion PC” is another way of saying “this isn’t ready for prime-time”. It’s a prediction of where computing will be 5-10 years from now. Does ChromeOS have more potential than the many other thin client projects that have come and gone every several years? Google’s deep pockets and long gaze are cause enough to pay attention. Watching its evolution will no doubt be informative.